BOWLING GREEN — On Friday, February 16, the district qualifying swimmers from both Galion and Colonel Colonel High Schools headed up to the campus of Bowling Green State University and the Samuel M. Cooper Natatorium, looking for a chance to advance to the state meet. When all was said and done for the meet, the Galion boys team and the Colonel Crawford Lady Eagles would have to wait for at-large bids, as only the top two finishers in each event were granted automatic bids. 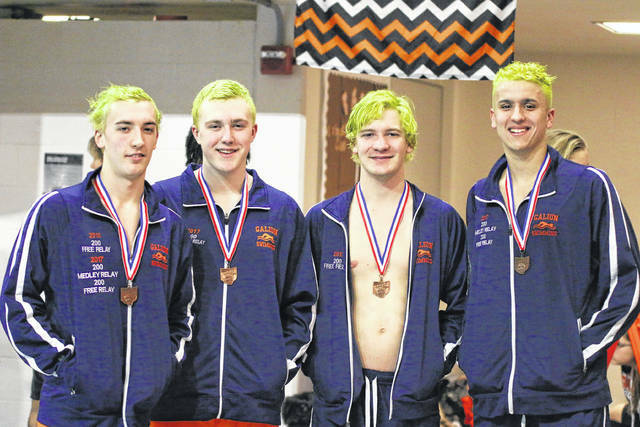 Once every district had reported their times and placements, Galion found out that all three of their relay teams would advance and sophomore Caleb Strack would advance thanks to their times swam at BGSU. 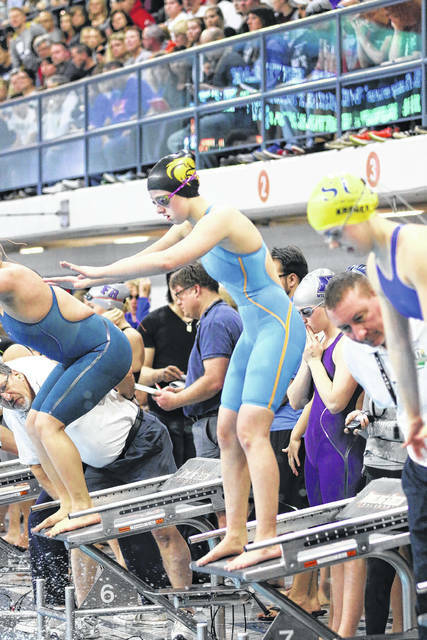 The Lady Eagles from Crawford would have the same fortune and will be sending their 200-yard medley and 200-yard freestyle teams to Canton later this week. Strack, the only individual from the two teams represented at districts, will be moving on in the 100-yard backstroke after a season-best time of 56.23 landed him a spot on the podium in fourth place. Strack’s time puts him as the 22-seed in the state preliminary qualifying. As for the relay teams for the Tigers, the 200-medley relay foursome of Strack, senior Luke Eisnaugle, junior Clay Karnes and senior Sam Rigdon placed 4th in the district, also with a season best time of 1:41.37. That time earned them the 19th seed heading into the state meet. In the 400-free relay, it was junior Weston Rose, sophomore Ben Altstadt, Strack and sophomore Alec Dicus placing 5th with a time of 3:22.64, another season best to qualify them for the state meet as a 19-seed as well. The 200-free relay of Altstadt, senior Luke Eisnaugle, Karnes and Rigdon placed 6th in the district in a time of 1:32.32, good for a 22nd seed at the state meet. For the Lady Eagles, it was the group of freshmen Cassidy Vogt and Kaisey Speck, joined by junior Jillianne Gregg and senior Pierce Krassow finding themselves moving on to state competition. Those four girls make up the Crawford 200-medley relay team, as well as the 200-free relay team that earned 6th and 10th, respectively, in the district meet. Vogt, Speck, Gregg and Krassow will enter state as the 23-seed in the 200-medley relay after swimming a 1:52.92 at BG and as the 20-seed in the freestyle relay after a 1:41.86 showing last Friday. Dicus may not have advanced to state competition on the individual event level but the sophomore did set a new team record in the 500-yard freestyle at BG, swimming the marathon of swim events in 5:02.82, earning him a spot on the podium in fifth place in the field. The Galion Lady Tigers lone representative, junior Sari Conner, swam in the 200-freestyle on Friday. Conner placed 29th overall with a season best 2:09.56. The swimmers that qualified for a run at state titles will head to the C.T. Branin Natatorium at Canton McKinley High School on Thursday, Feb. 22 for preliminary qualifying at 5 p.m. Advancement would lead to swimming the following day, also at 5 p.m. in the Division II state finals. Best of luck to the Tigers and Eagles that are moving on and congratulations to both teams on their respective seasons.